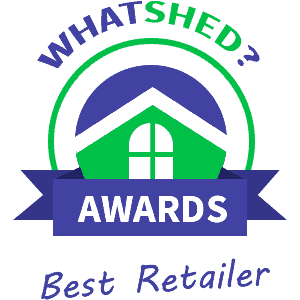 Find out who are the best plastic shed retailers in the UK. Here at WhatShed all we do all day independently review garden buildings. As you can imagine over the years we get to see hundreds of different products from a large variety of retailers and manufacturers. To help make your job easier we have decided to compile a list of the top 10 plastic shed retailers in the UK. The top 10 retailers on this list account for around 90% of the online plastic shed sales in the UK. As such you can be reassured that you are likely to find a retailer you will most likely be buying your plastic shed from on this list. description. The site does try a little too hard to give you all the info you need so it may be a little bit busy and over informative for some people. The site has a very friendly and fun kind of style and they make it very clear to show you their phone number and other contact info which we always like to see. may be out of luck here. The site though is very easy to use and they make it so easy to not just learn about their plastic sheds on the site, but also get in touch with them as well. If a more high end plastic shed is what you are after, then this is a site well worth spending time looking around. that perhaps they are trying to cram a little too much into their plastic sheds section as they have a phenomenal 77 products for you to browse through. Waltons do have an easy to navigate site and most of the products do have a vast amount of detail and photos, but there is the odd one that we feel could have benefited from a little more info. being given their own special space on the site. Each shed we look at had a detailed and easy to follow description and actually if their delivery times that they have listed on the site were a little shorter then they could have very well of taken the 4th spot on our list. This is a good site, but you will have to search around to see all that they have. quality, but of course higher priced, Grosfillex Plastic Sheds. Most sites do not really offer any customisation with their plastic sheds, but a few on here do let you tinker with them a bit in changing the colour of some of the structures. For some reason, this is not something they really brag about which really they should as they are one of the few sites who do offer some customisation options with these types of sheds. you are getting. With Homebase being a huge chain, in theory if something does go wrong with the shed then it should be easy to get in touch and get them to sort it out for you. So while the selection may be small, we are happy with how easy it is to browse those that they do have. All in all, we are actually very surprised and impressed with what Homebase are offering. are well described and most do have multiple pictures which is something we always like to see. Of course as this is B&Q if you want some extras then you can always easily search around the site and find them here and order at the same time as the shed. , the site is very easy to navigate and you will easily be able to find what you are looking for and each of the plastic sheds that they have are accompanied with a detailed description, although one or two more pictures of each shed would have been nice. man. The plastic sheds that they do have on their site do have plenty of information and many of them are showcased with multiple pictures so you can get a good look at them, but we think before you order a plastic shed from here, look to see if you can get it directly from another site first. They are also not well known for their customer service so also keep that in mind before you order.